WHAT IS THE PORTACLE ? The Portacle is a next generation, natural resonance biofeedback system that measures and analyzes the harmonic content of human breath and voice and feeds it back via a process called “binaural phasing” where the brain is required to reassemble and resolve the difference between the player and instrument of one’s reality. It is a real time measurement and feedback system that allows a person to see, hear and feel who they are at the most basic, primal and fundamental level of reality, beyond the quantum veil, in the spectral domain from which all reality originates and evolves. The binaural phasing of real and imaginary are returned visually, aurally, and kinesthetically via multisensory feedback on a person’s own computer. Resolving the difference between the real and imaginary components of one’s own personality can result in a quantum leap to the next highest level of order…and ultimately transformation from an evolutionary material creature to an existential spiritual essence…a process called Allasso by the ancient Greeks. In order to use the Portacle you will need only a computer with the minimum requirements (see below). However, the system works better with a headset rather than built in microphone and speakers. The ultimate set up would include a professional broadcast headset and an external sound card like an M-Audio or Scarlett Interface. In addition, a vibrotactile chair or table can be optionally added to further enhance the experience such that it is felt in every cell of the body. WHAT IS THE PURPOSE OR GOAL OF USING THE PORTACLE? o Innertainment – a method of recreation and enjoyment that teaches the art of seeking constructive healthy pleasure instead of those which are destructive. o Meditation – the greatest form of meditation ever developed because it teaches how to achieve deep levels of meditation with open eyes. Normally, it is difficult for many people to achieve any high level of relaxing alpha brain wave activity with their eyes open. However, that is when we need that ability the most, in normal day-to-day life. It has applications in Yoga, TM, Zen, Mantras, Toning, Contemplation and Worship. In addition, it allows sensory resonance via its multi-sensory forms of feedback. For more information about sensory resonance, please see the Portacle User’s Manual. o Stress Release and Management. o Rehabilitation and Habit Refocusing. o Personal Development – Self-Awareness, Exploration, Realization and Mastery. o Transformation – Mood, Career, Finances, Relationship and Home. o Sports – Centering, Grounding, Inspiring, Focus and Perseverance. o Vocal Training – Accuracy and Precision of Voice. o Manifestation of Intention – Obtaining, Achieving, Changing or Becoming. o Allasso – Transcending Human…Beyond Mortal… Transformation from an Evolutionary Physical Creature to an Existential Spiritual Essence. HOW IS THE PORTACLE DIFFERENT FROM OTHER MEDITATION AND PERSONAL DEVELOPMENT TOOLS? • It’s based on a next-generation quantum technology encourages transformation at the most basic level of universal automata, where all reality is homogenous. There are no differences between the physical, mental/emotional and spiritual aspects. The only aspects at this level are the differences between the real and imaginary or player and instrument. Encouraging change at this level is more elegant and efficient than it is on this side in the time domain where all the other aspects must be addressed and modified. For more information about the science behind the Portacle, please see http://www.theportacle.com/the-science/. • It utilizes a superior form of biometric measurement with which to observe a continual real time dynamic energy flow of a person by starting with intention as expressed by breath and voice. As the sages and mystics have said for eons, breath is the soul of life. Therefore, breath and voice are the preferred biometrics of choice to find out who a person is and what they want. For more information see the article on breath and voice at: http://www.theportacle.com/about/the-breath/. 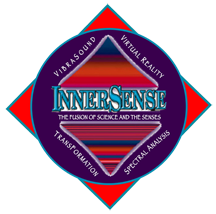 • It dramatically advances the sciences of visualization, meditation and biofeedback by combining them together into one coherent experience. In addition, it includes and advances the science of sound therapy by taking it beyond frequency and the quantum veil into the phase domain where all reality originates from the intentional combining of real and imaginary components…the interaction between the player and instrument. For more information see http://www.theportacle.com/the-science/. • It’s an advanced tool for personal development as it will allow anyone to practice and learn the art of creating their own reality. Being able to measure dominant outward radiation, it can be a marker for when the energy field is being radiated or absorbed. It also provides a means of redistribution and balance of the three main energy systems physical, mental/emotional, and spiritual. When used enough it can become a tool for Allasso, transformation from an evolutionary material creature into an existential spiritual essence. For more information see the User Manual that comes with the download. • It encourages eyes open meditation, an important life-coping tool that allows one to bring the results and benefits of meditation into use during everyday life. • It pioneers a new healing paradigm that identifies and enhances what’s right rather than finding and fixing what’s wrong. • It provides a new form of entertainment called InnerTainment™, which focus attention inward for an experience that many users declare equal or better than the best altered states of mind they have ever experienced. This includes various forms of stress management, relaxation, meditation, yoga, stress management, hypnosis, psychoanalysis, sound/music therapy, neuro-feedback, and even drug induced altered states of mind. The Portacle should never be used to replace such forms of therapy, but is the ultimate adjunct for any of them. • It can address the worse disease of mankind – anhedonism…the inability to experience pleasure. More commonly known as the “pleasure freeze” it is a state of mind that turns off the immune system for lack of purpose and desire to live. The Portacle is extremely entertaining and fun. It encourages healthy pleasure and active pursuit of transformation by providing all three requirements for transformation. o Active Pursuit through interesting and engaging auditory, visual and optional tactile feedback. o The Right Tools by providing the map, directions, vehicle, fuel and plan for the journey. o Dedicated Support – the natural resonance feedback and accumulator allow the user to become their own therapist and dedicated support. HOW DO I ORDER THE PORTACLE? 1. To purchase, go to our secure store at http://the-portacle.myshopify.com/. 2. After you have finalized your purchase you will be given a proof of purchase transaction (serial number), and allowed to download the product. 3. The first time you attempt to run the program you will be asked to enter the serial number you received along with you name and email address. Once you have entered that data the program will open and you will not need to enter the number again. That particular copy of the program is then linked to your computer and cannot be transferred to another. However, please save the serial number in case you have to reinstall later. 4. Your purchase allows you a single use license to use the Portacle on your computer only. The password you were given to open the program will not work on another computer. You can reload the program to your computer if needed with the same password. However, if you purchase a new computer, you must request permission from the same email address used during the original purchase or call for special permission. HOW DO I OPERATE AND USE THE PORTACLE? • The Portacle can be used to meditate, recreate, educate, learn, grow, change, inspire or ground your self. In addition, it can be a mind-ship that can blast you off to your next highest level of order. It can enhance any of these experiences if used properly with focus and intention. • Utilizing the Portacle at least 15 to 20 minutes or longer per day is recommended. Many utilize if for hours, or run it in the background as they are moving about in their homes and offices. • The real and imaginary automata are the smallest, most indivisible components of the machine and are very machine-like in character and behavior. Therefore, the more periodic and formal you can make your use of the Portacle™, the more you will receive from it. It’s all about active pursuit on your part. More time dedicated, the more often, the more scheduled and ordered you can make your transformation time the better. • Focusing on who you are when everything is right and you have everything you want is more important that intent to obtain, achieve or change something about yourself. Describing who you are as an optimal person is the most powerful intentions you can utilize with the Portacle™. You may breath your essence, whisper internal changes, speak external changes and/or tone your favorite mantras or sounds (Om). • For specific detailed instructions please consult the Portacle Users Manual. WHAT ARE THE REALTIME VISUAL IMAGES? What is the Portacle Visual? • Mathematical model of bridged state between the time and spectral domains. Each pixel in the portacle image represents one of the frequencies in the users breath or voice. Its color is the phase in relation to origin and the brightness indicates the volume or amplitude of that frequency. The placement of each pixel is determined by its real and imaginary coefficients. Why would I choose The Portacle image? Whereas the portacle image has a lot of entertainment and inspirational value, its use as a tool for change is limited to the fact that it is merely the current view of affairs. The Matrix images are more representative of the optimize state that the portacle can become in the spectral domain. In other words, the matrices are more indicative of a person’s quantum, spiritual essence. However, you are encouraged to occasionally watch these amazingly beautiful and totally dynamic images of yourself for stimulation, recreation and inspiration. It’s perfect to dance or move to as it closely follows the music or sound passing through. How is the Portacle image created? • The portacle image is created by plotting the real and imaginary partials on an X/Y Cartesian graph where the horizontal plane represent the real partials and the vertical plane is the imaginary partials. • Each pixel represents one of the frequencies in a person’s breath or voice. Its position on the image results from its real and imaginary coefficients, the color is its phase (or relationship of peak and valley to those of origin) and the brightness is its volume or amplitude. • Running accumulation of the portacle – allows a concept to be gathered over time and improves the precision of the indices that measure a person’s state of being…awareness, energetics, integration and orientation (the indices are an upgrade available with the human neurocomputer option). • The portacle image is a dynamic flow in real time of a person’s intention. The human breath and voice are so dynamic that they constantly and rapidly change from moment to moment. Without the accumulator, the images would change so fast that they are hard to observe. The accumulator holds onto each cycle of the portacle for a short period of time in order for one to observe their current state over a period of time. This is especially important when making the matrices from the portacle, as complex thought would be hard to observe. This allows the user to think, breath and/or talk about a particular subject over a period of time and then observe and listen to the entire accumulation. Why would I watch the Accumulator? Whereas we encourage users to try every possibility with the software, there would not be any currently known reason to watch the Accumulator, unless perhaps one wanted to take a look at a sequence of statements being held onto by the accumulator to see what they might have to reveal about the current actual state of what is being talked about. Represent user’s spectral essence. What their intention looks and sounds like in the spectral domain of reciprocal space. What are the Matrix visual images? – Real time, spectral domain diffraction images of the time domain portacle. • Spectral domain (other side-beyond the quantum) view of intention. • Mathematical model of the optimized, potential state of being. • Dynamic reflection of the internal quantum state and outer manner of being and doing. • Model of the quantum lattice of the complex waveform of breath or voice. • State space of the of the real and imaginary automata. • Mathematical model of intention – the smallest, most indivisible components of intention drawn into direct space. • Color palette upon which to paint or draw intention. • The matrices are created by shining a pure white light through the portacle accumulator to create a diffraction image which is populated onto the surface of a 12D torus then unfolded into a 2D image that can be seen on a computer screen. For more information please visit the science page at http://www.theportacle.com/about/science. What is the difference between the real, complex and imaginary matrices? How and when to choose. • The Real Matrices represent all of the cosine partials that originate from the player or operator of one’s reality. • The Imaginary Matrices represent all of the sinewave partials that originate from the interaction between the player/operator and the inherent properties of the instrument or body. • The Complex Matrices are the combination of the real and imaginary matrices. In other words, an overlay is made between the two images and they are blended into one. • Choosing the appropriate matrix to observe is as much of an art and intuition as it is a science. You are encouraged to choose by scanning through and intuitively choosing one that fits the moment. There is also more of a science that allows one to determine the sequence of the three possible choices (real, imaginary or complex) by a personality profiling system based upon how one approaches change in their life. There are seven modes. For more information please see the Portacle User’s Manual. • All geometries originate from combinations of real and imaginary components. Human breath and voice are nothing more that combinations of real and imaginary components. Therefore, as you speak and breath you are drawing images on the screen in three dimensions inside of the twelve dimensional torus. Anything is possible. Learning how to control these images, or more specifically, learning how to see what one wants to see in the images, is the ultimate expression and use of the Portacle. • Specific geometries like points, lines, circles and other shapes do have specific meaning. In addition, colors have emotional significance. Many systems exist that show these correspondences. For more information, please see the Portacle User’s Manual. When to choose the matrices? The matrices are the prime visual one should watch while using the portacle. Spending at least 15-20 minutes per day or more is suggested. WHAT ARE THE AURAL RENDERINGS? • Optimized Resonance™ Biofeedback – The first is a feedback of the actual voice of what is being breathed or voiced. The signal is taken and the noise removed, leaving only the harmonic partials, which are separated at fed back to opposite ears. The real partials are routed to the left ear and the imaginary ones are sent to the right ear. The user is required to reassemble via resolution by whole-brain synchrony. The brain has to make up the difference between the two signals and it is “heard” as a binaural phase. This is similar to binaural beat, but with phase instead of frequency. It is not entrainment, but rather resolution. • Sonic Reinforcement™ Biofeedback – The harmonic partials are analyzed for magnitude and those that are in the most need of support are fed back to separate ears. As above, the real is routed to the left ear/right brain while the imaginary is directed to the right ear/left brain. o The Temporal/Spectral dial allows choice of mix between these two modes of feedback. This knob turns up and down by clicking on it and dragging the mouse either up or down. All the way down (left) emphasizes the spectral sonic reinforcement. Turning the knob up (right) brings in the temporal (voiced) feedback until the voice is more emphasized on the right extreme. o What is the difference between the Aspiration and Intention modes of the Sonic Reinforcement mode of aural-feedback? • The Aspiration Mode – This mode was designed for breathing and begins to slowly build up a set of harmonics from the breath that over time, can represent those harmonics that need most support and feeds that back real & imaginary to left and right ears. • The Intention Mode – This modes begins immediately and feeds back what the person has just said, harmonized and optimized and separated into real and imaginary to left and right ears, requiring resolution via binaural phasing and subsequent resolution. o Why does the Intention Mode sound like echo? • The Intention mode feeds back, over and over again until the Accumulator eventually lets it go. If you stop speaking the echo will continue until it fades away. If you continue to speak, the sounds become mixed and combined with the sonic reinforcement feedback and the echo effect diminishes into the mix. o The indices are an optional upgrade to the Portacle™ suite of tools. They come as part of an add-on option called the Human Neurocomputer (see below). o The indices are ratios of real and imaginary combinations that correlate to states of being like awareness (in/out), energetics (work/rest), integration (connected/disconnected) and orientation (past, present or future). o The indices run in real time as well so it is possible to breathe, whisper, talk or think about anything and instantly observe what it does to your energy field. o The indices can also be used as control parameters for gaming. WHAT IS THE HUMAN NEUROCOMPUTER? o The Human Neurocomputer™ is an optional upgrade to the standard suite of Portacle tools for transformation. It consists of expanded software algorithms and hardware in the form of a headband that contains two dry electrodes which measure the raw bioenergetic signals from the brain, which can be utilized as a supercomputer to allow analog computing in addition to the processors of the digital computer being used. This is accomplished through presenting an array of multiple potentials through adaptive-stochastic automata until the mind collapses the wave function of these into a singular state vector outcome. In the Portacle, this human neurocomputing paradigm is employed in the calculation of the real-time state of being indices (see above). o Another use of the Human Neurocomputer™ is as a training tool allowing the user to learn how to collapse the wave function, or actualize / manifest reality from multiple possibilities, at will. Its NeuroLink™ bi-phasic I/O display shows both the wave function stimulus to and quantum mind-body problem resolving response from the neurocomputer, taking the Portacle™ experience to the next level by providing a way to actually witness wave function collapse very similar to the way they are observed in atom smashers / particle accelerators like the Large Hadron Collider. o However, instead of collapsing protons, we are collapsing all of the potentials held to become our present and future realities through thought and perception. 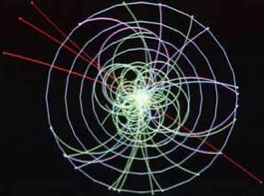 When the user collapses a wave function to one of many possibilities being offered to them, the image looks much like the event screen of atom smashers when they collapse the wave function into a set of observable particle trails. However, the Portacle screen reveals the collapse of thought waves rather than protons. o Below are actual screen shots of a user collapsing wave functions in the Portacle. Notice how it looks similar to the image above that shows protons smashing together in a collapse. Clicking on the image below will link to a video on our website that shows this process in action. o The Human Neurocomputer™ can also function as a true random number generator – Dean Radin of the Noetic Society and others have demonstrated that such devices reveal the entanglement of the collective consciousness. The sampling rate determines the degree of accuracy. o The fastest computer in the world is the human mind. The Human Neurocomputer™ takes advantage of this understanding, integrating the human brain as a most powerful analog coprocessor – a personal quantum computer, if you will – and providing the neural interface technology through which to measure, analyze and utilize the results to calculate indices and provide a measure of the biostatic field that originates the human aura. It allows the human body to become an antenna for the universal vibrational spectrum. WHAT IS THE SCIENCE BEHIND THE PORTACLE ? The science behind the portacle combines components from voice and breath analysis, sound-light-vibration therapy, biofeedback, spectral conversion, quantum physics and universal automata including adaptive stochastic automata into one synchronous, coherent experience. For more information see http://www.theportacle.com/the-science/. WHAT IS THE RESULT OF USING THE PORTACLE ? o Emotional catharsis and cathersis – sequential rapid disassembly, rearrangement and reassembly. WHAT ARE THE MINIMUM COMPUTER REQUIREMENTS FOR THE PORTACLE ? WHAT IS THE COST OF THE PORTACLE ?